Fruit and chocolate are a natural fit! 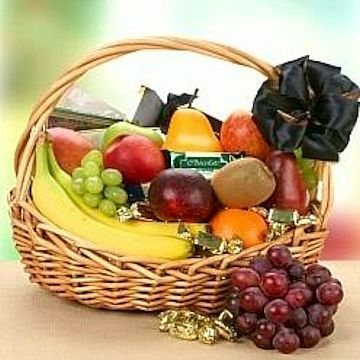 Our rustic basket begins with an assortment fresh fruits such as apples, bananas, oranges, and pears. Then we fill it with an assortment of the best gourmet chocolates available. Beautifully presented in colored cellophane with a matching bow, this basket will delight anyone, anytime! Exact basket, fruit, and chocolate selection may vary by season and delivery location. Deluxe basket is shown. The Chocolate and Fruit Orchard has been purchased most frequently by our customers for the following occasions: Get Well, Sympathy, Thank You, Birthday, and Christmas.